Reflected clouds at Falls Park. Missouri River sunset in Clay County. 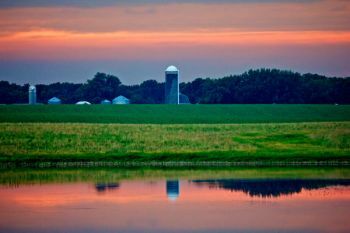 Sunset reflection at Mud Lake in Turner County. Capital reflection from Fort Pierre. Iced over melt water near Chancellor. 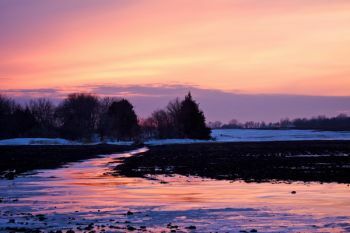 March sunset with iced over waterway in rural Turner County. 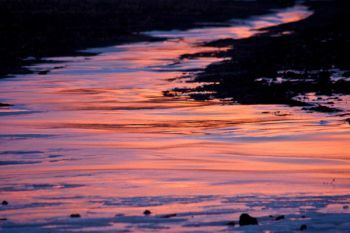 A late winter Lake Vermillion sunset after a melt and refreeze. 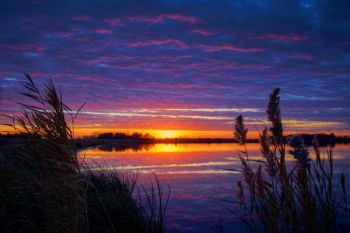 Spring rains and sloughs can also offer unique rural reflection opportunities. 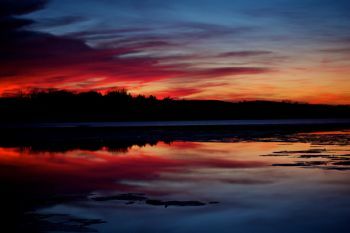 A reflected sunset at Orman Dam near Belle Fourche. 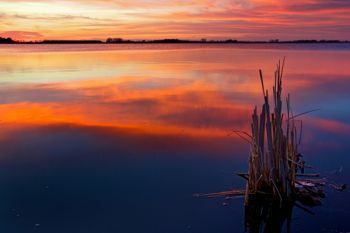 A long exposure at Island Lake on the border of Minnehaha and McCook counties. A short exposure (with tilt shift effect added afterwards) for a totally different look and feel. 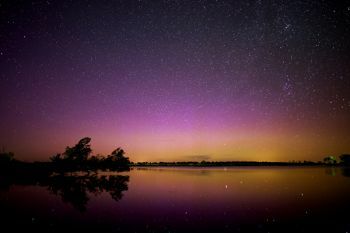 This was taken at Island Lake on the same evening. 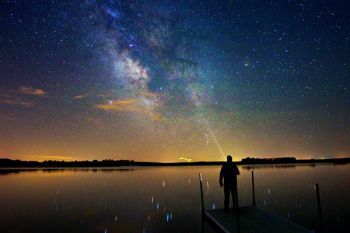 Summer nights can provide glassy water good enough to reflect starlight like this self-portrait with the Milky Way and a lightning bug photo bomb taken at Island Lake last summer. Faint Aurora, a distant shooting star and plenty of stars are reflected in Lake Louise north of Miller in this image taken late last summer. 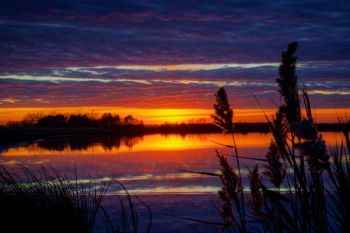 A colorful fall sunset reflected in Covell Lake in Sioux Falls. 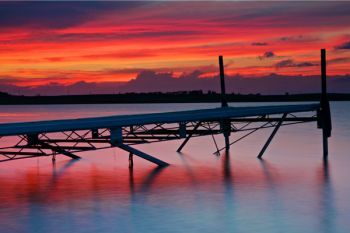 Colorful post sunset cloud reflections at Mud Lake in Turner County. 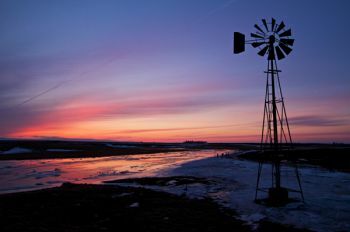 As the end of February approaches, the days of melting snow, muddy shoes and the long awaited first signs of spring are right around the corner. I loved this time of year as a kid. Not so much because spring was coming, but for all the fun I found playing in the roads and trails on our little dairy farm. My imagination ran wild as I dammed and diverted melt water into canals and rivers. Then I’d turn into Godzilla and destroy all my work with stomping, kicking and gleeful mayhem. The only problem explaining to Mom why my coveralls were covered in mud. I suppose I’m too old to go play in the mud and melt water nowadays. But photography has given me another way to go have fun this time of year, because it’s a great time to shoot reflection photos. Earlier this month, there was a brief warm up. 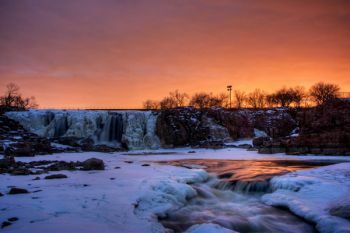 It was enough to get some extra melt water flowing at Falls Park in downtown Sioux Falls. 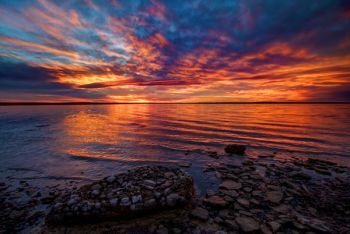 During this warm spell and after work one evening, I happened to notice the clouds were lining up for a colorful sunset. 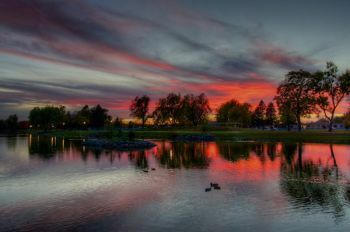 I hustled down to the park just in time to catch the sky turn golden with reflected light. 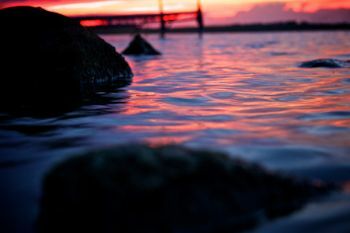 My favorite photo of the evening wasn’t of the sky though, but the reflection of the clouds in the running water. 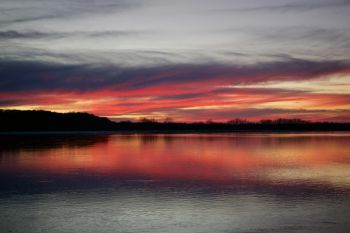 Just a week earlier, I had witnessed a beautiful pink/purple sunset times two in a reflection on the open water of the Missouri River at Myron’s Grove boat ramp in southwest Clay County. 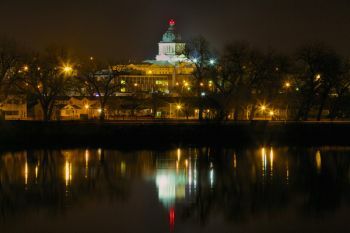 It reminded me of a view of our state capital building in Pierre that I witnessed last April on a still night from the Fort Pierre side. The graceful dome shone twice as nice with the help of the relatively calm waters of the Missouri River. Reflections like that can magically take a good scene and make it memorable. I was asked recently if I prefer to get crisp and clear water reflection photos or the long exposure variety that smooth the flowing water and give it a misty, almost ghostlike quality. I had to think about that one for a while. To be completely honest I like to capture both if I can. A perfect mirror reflection requires a short exposure and often results in dramatic and powerful images. 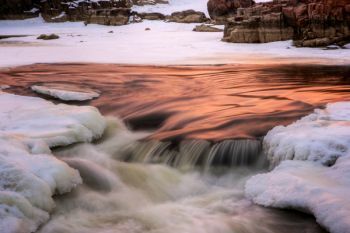 The long exposure water photos add a sense of mystery and elegance to the scene, which can be quite beautiful as well. One last thing. I am fully aware that finding calm water may be difficult in our great state where the wind likes to blow. But all is not lost. This time of year provides ample opportunity to find interesting reflections in icicles and iced over melt water as well. As for the mud and mess that will result, I can’t help you. Again, well done in both the photos and the text. Beautiful photos and I enjoyed the story. Your Kruger "cousins" enjoyed the mud, too, as kids. I don't think the "boys" would admit it, but they still like the challenge of driving a tractor through a wet spot in a field.